ROGAINE® is the 1st FDA-approved brand to treat hair loss in both men and women by stimulating your hair follicles to regrow thicker, fuller hair. The revolutionary formula in ROGAINE® begins to work on contact with patented Tricho-Prime™ Technology, a proprietary combination of ingredients that primes your scalp for optimal hair regrowth. ROGAINE® is the #1 dermatologist-recommended hair regrowth brand clinically proven to help regrow your hair. In hereditary hair loss, a combination of genetics, hormones, and age causes progressive shrinking of hair follicles, shortening your hair’s growth cycle. Left untreated, each growth cycle produces shorter, finer, hairs until growth ceases, so start using ROGAINE® as soon as you notice thinning hair. ROGAINE® penetrates your scalp to restore inactive hair follicles and increase protein production to lengthen your hair’s active growth phase. Within 3-4 months of using ROGAINE®, you’ll begin to see visible results. With continued use, you’ll enjoy improved coverage with thicker, fuller hair. WHAT HAPPENS IF YOU STOP? If you stop using ROGAINE®, your normal hair loss process will start again, and you’ll probably lose your newly regrown hair within 3-4 months. For more than 20 years, ROGAINE® brand hair regrowth treatment has been the long-standing industry leader. 9 out of 10 men noticed results using Men’s ROGAINE® foam twice daily for 16 weeks vs. a placebo in a 4-month clinical study. More than 80% of women using Women’s ROGAINE® foam once daily increased their hair count in a 6-month placebo-controlled clinical study. 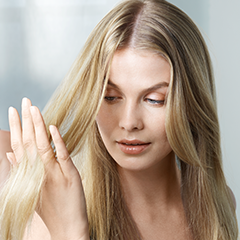 Hair Growth Expert Dr. Henry answers key questions around Hair loss and explains why she recommends Rogaine® & its active ingredient minoxidil to regrow thicker fuller hair. See how ROGAINE® has helped so many others regrow their hair.